The Hotel Quinta da Serra, located in the parish of Jardim da Serra, in the upper areas of Câmara de Lobos has a strong historical, social and botanical component associated with luxurious facilities. Taking advantage of these valences is the ambition of the current Administration to preserve and enhance the natural resources characteristic of the island of Madeira. In this sense, this establishment was equipped with technology that aims at economic sustainability and above all environmental, fulfilling the norms defined by the program Green Key (https://greenkey.org.uk/ or https://greenkey.abae.pt/) having obtained the Green Key Award for Hotel Establishments from 2016 until this year. As an example of the environmental technologies used, we have solar panels and a WWTP that allows the use of wastewater for irrigation, thus increasing the efficiency in the management of water resources. In addition, of its 9.6 ha of land, Quinta's administration opted to convert the entire area with agricultural aptitude to the organic production method (MPB), that is, more than 25,400.00 m2 of land. Among these 2,300.00 m2 are cultivated with vegetables; 18,700.00 m2 with various fruit trees and 4,400.00 m2 with vineyards of the Sercial variety. This is one of the so-called "noble castes", which contributed a lot to what we know today as Madeira Wine. The Quinta also has more than 30.000,00 m2 of forest area, mostly reforested with species belonging to the exuberant Laurissilva forest, initially destroyed by the first settlers for the construction of cultivated areas. In the end, we returned to Mother Nature what was already hers. It was also on this property that the first tea plants (Camelia sinensis) were introduced, by the founder of this property, the English consul Henry Veitch. With the passage of the years and with the abandonment to which the Quinta was subject, this species was lost. With the renovation made in our Quinta in 2013/2014, new plants were introduced, in order to preserve this historical aspect. In order to give consistency to the valorization of regional products and to organic farming itself, we certify, as organic, the Hotel's restaurant. In this way, customers can taste dishes exclusively prepared with "bio" products, produced in the place where the restaurant is inserted, a particularity that guarantees an unequaled freshness. It is with this incessant search for authenticity and preservation of history and biodiversity that we invite you to explore this curious space of Madeiran identity. Long ago, in the early nineteenth century, a young Englishman fell in love with the island and decided to stay here. He was related to trade in Madeira wine to the UK and was one of the first of this trade, having introduced the sercial vine variety. His interests went far beyond the wine and vineyard, having introduced to the island also the tea plant and many exotic species of trees. 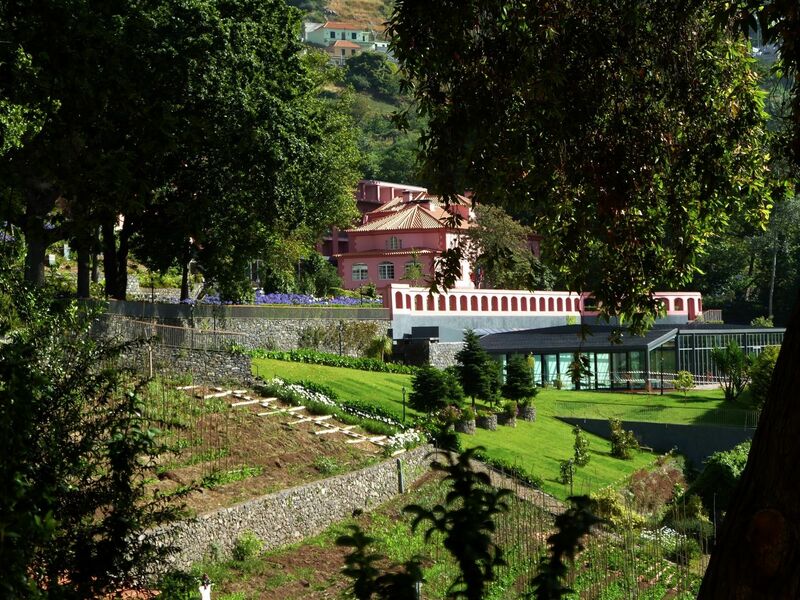 He acquired an estate of over 1,155 square meters, where he built his vacation home - the current Quinta da Serra. By working the land he has created beautiful gardens, which can still be seen in Quinta da Serra lands. One of his legacies is also the name he gave to the area Jardim da Serra. With the foundation of his mansion, the consul preserved the oldest native trees and introduced new species brought from all over the world. The planting of trees was done only by women, because it was believed that their hands conveyed fertility needed for good growth of a plant. 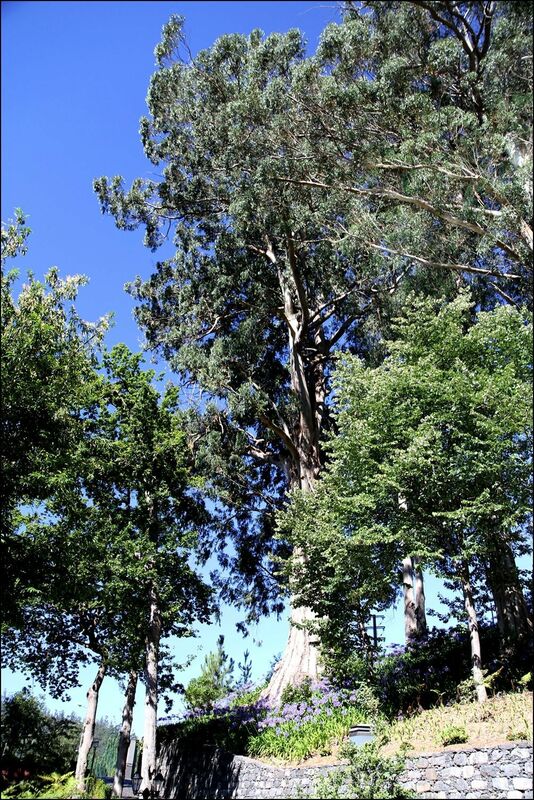 Of all the trees that he planted, one stands out, a majestic eucalyptus which is on the entrance to the Quinta, and is the tallest tree referenced in Madeira, with more than 64 meters tall. It is assumed that this eucalyptus has over 200 years of age, and most of the trees that surround it are even older, therefore they emanate an energy that you can feel visiting the gardens that reminds us of the affection and care putted in planting and conservation of those trees. Many visitors of Quinta da Serra tend to approach the tree in an emotive way, embrace it, thus absorbing much of the energy it conveys, but also leaving some of its own energy that stays in the tree and then convey to those who, in the future, embrace it. It is under his shadow we rest and recover our energy, thus this eucalyptus, as it seems, condense all power, all purity and all the wisdom that this place holds and trying to pass it on to anyone who passes by and approach it. ACCEPT OUR INVITATION AND COME TO EMBRACE THIS HIGHEST TREE OF MADEIRA.